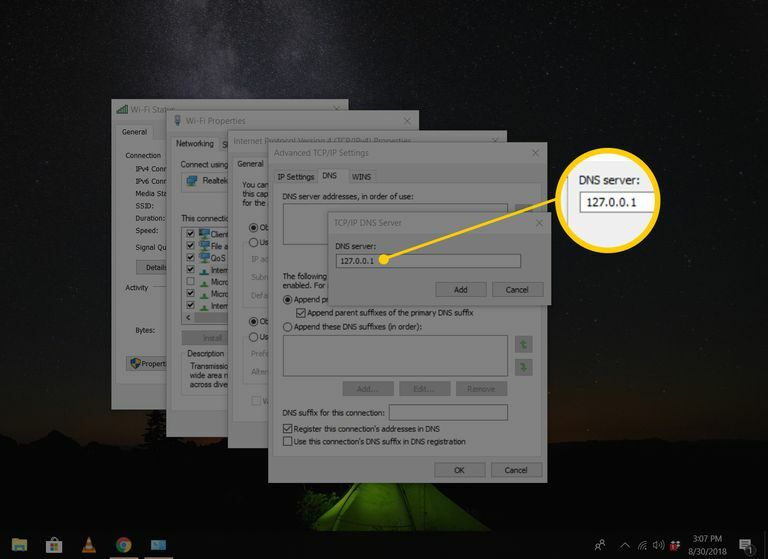 Your computer might have the 192.168.1.115 private IP address assigned to it so that it can communicate with a router and other networked devices. However, it still has this special 127.0.0.1 address attached to it to mean "this computer," or the one you're currently on. The loopback address is only used by the computer you're on, and only for special circumstances. This is unlike a regular IP address that is used to transfer files to and from other networked devices. For example, a web server running on a computer can point to 127.0.0.1 so that the pages can be run locally and tested before it's deployed. All messages generated by TCP/IP application software contain IP addresses for their intended recipients; TCP/IP recognizes 127.0.0.1 as a special IP address. The protocol checks each message before sending it onto the physical network and automatically re-routes any messages with a destination of 127.0.0.1 back to the receiving end of the TCP/IP stack. To improve network security, TCP/IP also checks incoming messages arriving on routers or other network gateways and discards any that contain loopback IP addresses. This prevents a network attacker from disguising their malicious network traffic as coming from a loopback address. Application software typically uses this loopback feature for local testing purposes. Messages sent to loopback IP addresses like 127.0.0.1 do not reach outside to the local area network (LAN) but instead are delivered directly to the TCP/IP and receive queues as if they had arrived from an outside source. Loopback messages contain a destination port number in addition to the address. Applications can use these port numbers to subdivide test messages into multiple categories. The name localhost also carries a special meaning in computer networking used in conjunction with 127.0.0.1. Computer operating systems maintain an entry in their host's files associating a name with the loopback address, enabling applications to create loopback messages via name rather than a hardcoded number. Internet Protocol v6 (IPv6) implements the same concept of a loopback address as IPv4. Instead of 127.0.0.01, IPv6 represents its loopback address as simply::1 (0000:0000:0000:0000:0000:0000:0000:0001) and, unlike IPv4, does not allocate a range of addresses for this purpose. IPv4 reserves all addresses in the range 127.0.0.0 up to 127.255.255.255 for use in loopback testing, although 127.0.0.1 is (by historical convention) the loopback address used in almost all cases. 127.0.0.1 and other 127.0.0.0 network addresses do not belong to any of the private IP address ranges defined in IPv4. Individual addresses in those private ranges can be dedicated to local network devices and use for inter-device communication, whereas 127.0.0.1 cannot. Those studying computer networking sometimes confuse 127.0.0.1 with the address 0.0.0.0. While both have special meanings in IPv4, 0.0.0.0 does not provide any loopback functionality.